For other uses, see Ufa (disambiguation). Ufa (Russian: Уфа́, tr. Ufá, IPA: [ʊˈfa]; Bashkir: Өфө Öfö; Bashkir pronunciation: [ʏ̞ˈfʏ̞], pronunciation (help·info)) is the capital city of the Republic of Bashkortostan, Russia, and the industrial, economic, scientific and cultural center of the republic. As of the 2010 Census, its population was 1,062,319, making it the eleventh most populous city in Russia. Gerardus Mercator's map of Europe with Pascherti (Bashkort) settlement presumably in the position of modern Ufa. 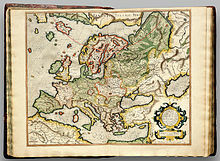 Map was compiled in 1554, twenty years before the official date of the foundation of Ufa. Early history of the surrounding area of Ufa dates back to Paleolithic times. Presumably, from the 5th to the 16th century there was a medieval city on the site of Ufa. On the Pizzigano brothers' map (1367) and on the Catalan Atlas (1375) a town approximately on the Belaya River was designated Pascherti (Bashkort), and Gerardus Mercator's map (1554) also marked the settlement with the Pascherti name. French orientalist Henri Cordier associates the position of Pascherti with the current location of Ufa. Ibn Khaldun called the town, among the largest cities of the Golden Horde, Bashkort. Russian historian of the 18th century Peter Rychkov wrote that there was a great city on the territory of Ufa before the arrival of the Russians. The official of the Orenburg Governorate government Vasily Rebelensky wrote that Ufa was founded by the Bashkirs. By order of Ivan the Terrible a fortress was built on the site of modern Ufa in 1574, and originally bore the name of the hill it stood on, Tura-Tau. 1574 is now considered to be the official date of Ufa's foundation. Town status was granted to it in 1586. Before becoming the seat of a separate Ufa Governorate in 1781, the city, along with the rest of the Bashkir lands, was under the jurisdiction of the Orenburg governors. And even though the 1796 reform reunited Orenburg and Ufa again, in 1802 the city of Ufa became a new center of the entire Orenburg Governorate that included large territories of modern-day Republic of Bashkortostan, Orenburg Oblast, and Chelyabinsk Oblast. During the 1800-1810s, Scottish Russian architect William Heste developed a general city plan for Ufa as a regional capital shaping the modern outline of its historical center. The Belaya River Waterway (1870) and the Samara-Zlatoust Railroad (1890) connected the city to the European part of the Russian Empire and stimulated development of the city's light industry. 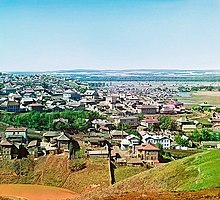 As a result, by 1913 the population of Ufa grew to 100,000. During World War II, following eastward Soviet retreat in 1941, the Abwehr operated in Ufa, 1941-1943, some German infiltration, occurred 1914-1943 in espionage, a number of industrial enterprises of the western parts of the Soviet Union were evacuated to Ufa. The city also became the wartime seat of the Soviet Ukrainian government. During 9—10 July 2015 Ufa hosted summits of the BRICS group and the Shanghai Cooperation Organisation. Ufa is the capital of the republic and, within the framework of the administrative divisions, it also serves as the administrative center of Ufimsky District, even though it is not a part of it. As an administrative division, it is, together with twenty-four rural localities, incorporated separately as the city of republic significance of Ufa, an administrative unit with status equal to that of the districts. As a municipal division, the city of republic significance of Ufa is incorporated as Ufa Urban Okrug. According to Forbes, in 2013, Ufa was the best city in Russia for business among cities with population over one million. Many urban enterprises engaged in oil refining, chemistry, and mechanical engineering reside in Ufa. Additionally, the economy of Ufa is composed of many fuel, energy, and engineering complexes. Ufa is home to about 200 large and medium industrial enterprises. Ufa is linked by railways to the rest of Russia, having a railway station on a historic branch of the Trans-Siberian Railway. Ufa is the only city connected to Moscow by more than one federal highway. The M7 motorway links the city to Kazan and Moscow and the M5 motorway links Ufa to Moscow and to the Asian part of Russia. The Ufa International Airport has international flights to the United Arab Emirates, Turkey, Greece, Egypt, Azerbaijan, Uzbekistan, and Cyprus as well as domestic flights to many Russian cities and towns, including Moscow. 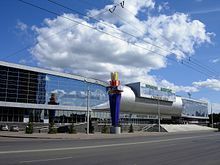 The Ufa Metro is a planned and oft-delayed subway system, discussed since the late 1980s. On May 30, 1996, there was a ceremony marking the beginning of preparatory construction work, attended by then-President Boris Yeltsin. Public transportation in Ufa includes trams (since 1937) and trolleybuses (since 1962), as well as bus and marshrutka (routed cabs) lines. The population of Ufa exceeded one million in 1980. Ufa is situated in eastern Europe near its land boundary with Asia, at the confluence of the Belaya (Agidel) and Ufa Rivers, on low hills forming the Ufa Plateau to the west of the southern Urals. The area of the city is 707.93 square kilometers (273.33 sq mi). It stretches from north to south for 53.5 kilometers (33.2 mi) and from west to east for 29.8 kilometers (18.5 mi). Ufa has a warm summer continental climate (Köppen: Dfb) at the same time as the parallel is the northern boundary of this climate in the Canadian prairies. Strict winters but in some cases summers can be quite hot. In terms of temperature is very similar to International Falls, Minnesota. Council, a representative body. Formed of 35 deputies for 4 years. Chairman of the Board – the head of the urban okrug. Term of 4 years. Urban Okrug Administration. The structure of the administration approved by the Council on the proposal of the Head of the Administration. Head of the Administration manages the administration on the principles of unity of command. He is appointed under a contract entered into by the results of the competition. The term of office of the Head of the Administration is limited to the period of office of the Council of the convocation. In Ufa there is the Ufa branch of the Financial University and the Ufa branch of the Russian State Economic University. Plekhanov, where there are practically no check digits for admissions to the budget. They are housed in good-quality buildings, but they don’t benefit from them to society, more and more often rumors are circulating about them that they are designed for siphoning money - since there are practically no budget places for economic specialties in Ufa. In the economic specialties of the magistracy, the plan for admission to Ufa universities is no more than 30 budget places. Periodically, a suffocating, unpleasant chemical smell is felt on the territory of the Ufa . The media reports about the smell come out with an enviable regularity. All these reports are not groundless, and the culprits are getting out of responsibility due to the fact that there is no Continuous Emission Control System (CEMS) in the city. Absence of cleaning streets, there are no street vacuum cleaners, road vacuum sweepers, industrial (street) vacuum cleaners on the streets. Unfortunately, there is a complete lack of cleaning in the city. According to the letter of the Federal Service for Hydrometeorology and Environmental Monitoring (Roshydromet) No. 20-18 / 218 of 11.07.18: "In the framework of solving problems at the federal level in the implementation of the state monitoring of atmospheric air, the territorial office of Roshydromet - FGBU Bashkir UGMS monitors pollution of atmospheric air in Ufa at 9 stationary posts of the state observation network located in different parts of the city to estimate the level of air pollution generated by the total release and stationary and mobile sources of pollutants. Suspended substances (dust) are measured at all 9 posts of the state observation network. The results of observations of the pollutants content are presented on the official website of the Bashkir State Hydrometeorological Service in the section "Monitoring of environmental pollution" (http://www.meteorb.ru/monitorinu/air-pollution-ufa) daily and monthly. In 2017, the maximum single concentration of suspended solids reached 4.6 MPC m. in March 2017, at the address: Oktyabrya Ave., 141, located near the motorway with heavy traffic, and in April 2017 at the post: Dostoyevsky St., 102/1, located in the area of the industrial enterprise. During 2017 almost all posts of the state observation network recorded exceedances of a single concentration of suspended substances. At the same time, in order to implement regional state environmental oversight aimed at preventing, detecting and suppressing violations by public authorities, local authorities, and legal entities, individual entrepreneurs and citizens of requirements in the field of atmospheric air protection, under the Ministry of Natural Resources and the Environment of the Republic Bashkortostan operates the State Bank of the Republic of Belarus "Office of State Analytical Control", to whose tasks, including GSI "organization of periodic environmental monitoring mobile laboratories in the areas where the population lives in the republic and in the zones of protective measures in the system of the general program of integrated environmental and sanitary-hygienic monitoring. " Going to the site http://www.meteorb.ru/monitoring/air-pollution-ufa found that all 9 posts of the state observational network of Roshydromet are located at a considerable distance from the area of Inors and Sipaylovo, from residential areas. Control of MPC and air quality in residential areas is not carried out. Lyalya Tyolpan Mosque (left) and Cathedral of the Nativity of the Theotokos. The major religions in the city are Sunni Islam and Russian Orthodoxy. The Bezpopovtsy strain of Russian Old Believers is also registered in Ufa. Ufa is a place of location of The Central Spiritual Administration of Muslims of Russia [ru]. In 1989, the Russian Islamic University was opened. One of the largest mosques in Europe, Ar-Rahim [ru], is under construction in Ufa. Amina Hanum Syrtlanoff (1884–1939?) chairman of the Petrograd Muslim Educational Society. Sergey Baklykov, host of popular YouTube channel Real Russia. ^ The official website of Ufa does not list an anthem among the official symbols of the city. ^ a b Энциклопедия Города России. Moscow: Большая Российская Энциклопедия. 2003. p. 498. ISBN 5-7107-7399-9. ^ a b Государственный комитет Российской Федерации по статистике. Комитет Российской Федерации по стандартизации, метрологии и сертификации. №ОК 019-95 1 января 1997 г. «Общероссийский классификатор объектов административно-территориального деления. Код 80 252», в ред. изменения №278/2015 от 1 января 2016 г.. (State Statistics Committee of the Russian Federation. Committee of the Russian Federation on Standardization, Metrology, and Certification. #OK 019-95 January 1, 1997 Russian Classification of Objects of Administrative Division (OKATO). Code 80 252, as amended by the Amendment #278/2015 of January 1, 2016. ). ^ Псянчин А. В. Башкортостан на старых картах. Уфа, 2001. С 70, 71, Он же. Mons Et Urbis: Уральские горы и город Уфа в европейской средневековой картографической традиции//Архив Башкортостана, № 1. 2007. С. 17-23. ^ Рудаков В. Г. К вопросу о двух столицах в Золотой Орде и местоположении города Гюлистана // Научное наследие А. П. Смирнова и современные проблемы археологии Волго-Камья. Материалы научной конференции. Труды ГИМ. Вып. 122. — М., 2000. — Рис. 1. ^ Там же; Псянчин А. В. Башкортостан на старых картах. — Уфа, 2001. — С. 71. ^ Мажитов Н.А,, Султанова А. Н. Сунгатов Ф. А. Башкирские города по арабским источникам IX—X вв. // Вестник АН РБ. 2008. Т. 13, № 2. С. 44-—48; Мажитов Н. А., Сунгатов Ф. А., Иванов В. А., Сатаров Т. Р., Султанова А. Н., Иванова Е. В. Городище Уфа II. Материалы раскопок 2006 года. Т. 1. Уфа, 2007. 160 с: ил. ^ Золотая Орда в источниках. T.I. Арабские и персидские сочинения. М., 2003. С 169. ^ Рычков П. И. История Оренбургская (1730—1750 гг.). Оренбург, 1896. С. 68,69. ^ «Краткое описание губернского города Уфы с начала его построения до сего 1806 года». // Что ж касается башкирцев, то видно из многих описаний, как сего народа, так и о жительстве их, кои от различных возмущений, как и междоусобных воин, так и соседних своих народов, строили маленькие укрепления и городки и наконец, соединясь во множестве, распространили свои жилища и укрепления, а для сей причины и город Уфа построен. ^ "Ufa, Russia Köppen Climate Classification (Weatherbase)". Weatherbase. Retrieved November 13, 2018. ^ "Average Weather in International Falls, Minnesota, United States, Year Round - Weather Spark". weatherspark.com. Retrieved November 13, 2018. ^ "Weather and Climate – The Climate of Ufa" (in Russian). Weather and Climate (Погода и климат). Retrieved December 8, 2015. ^ "Ufa Climate Normals 1961–1990". National Oceanic and Atmospheric Administration. Retrieved December 8, 2015. ^ "Charter of the Urban Okrug of Ufa of the Republic of Bashkortostan". Archived from the original on December 1, 2010. Retrieved July 3, 2010. ^ "БАШКОРТОСТАН". Православная Энциклопедия. Retrieved October 29, 2016. Закон №166-з от 26 декабря 2014 г. «О статусе города Уфы — столицы Республики Башкортостан». Вступил в силу по истечении десяти дней со дня официального опубликования (6 января 2015 г.). Опубликован: официальный Интернет-портал правовой информации Республики Башкортостан http://www.npa.bashkortostan.ru, 27 декабря 2014 г. 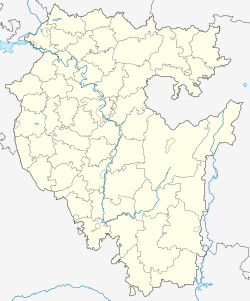 (Law #166-z of December 26, 2014 On the Status of the City of Ufa—the Capital of the Republic of Bashkortostan. Effective as of the day which is ten days after the day of the official publication (January 6, 2015).). Совет городского округа города Уфа Республики Башкортостан. Решение №3/6 от 15 декабря 2005 г. «Об Уставе городского округа город Уфа Республики Башкортостан», в ред. Решения №41/2 от 28 января 2015 г. «О внесении изменений в Устав городского округа город Уфа Республики Башкортостан». Вступил в силу 29 декабря 2005 г. Опубликован: "Вечерняя Уфа", №248 (10396), 28 декабря 2005 г. (Council of the Municipal Formation of the City of Ufa of the Republic of Bashkortostan. Decision #3/6 of December 15, 2005 On the Charter of the Urban Okrug of the City of Ufa of the Republic of Bashkortostan, as amended by the Decision #41/2 of January 28, 2015 On Amending the Charter of the Urban Okrug of the City of Ufa of the Republic of Bashkortostan. Effective as of December 29, 2005.). This page is based on the Wikipedia article Ufa; it is used under the Creative Commons Attribution-ShareAlike 3.0 Unported License (CC-BY-SA). You may redistribute it, verbatim or modified, providing that you comply with the terms of the CC-BY-SA.